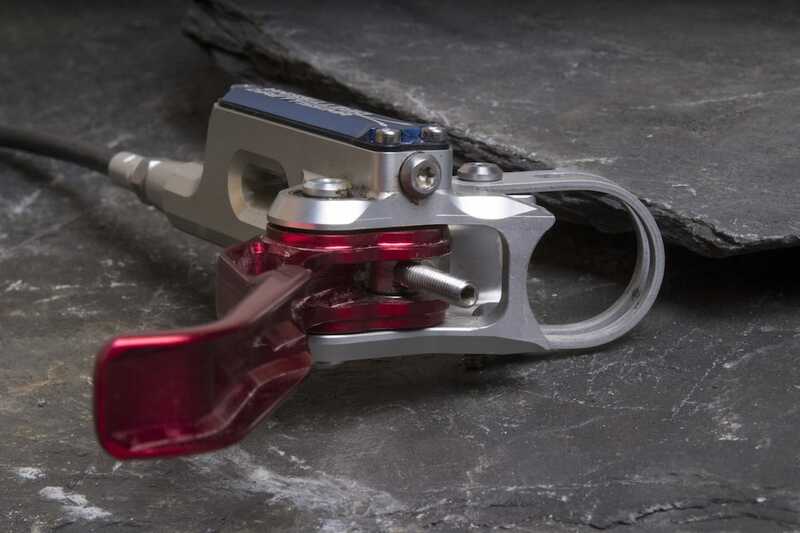 In Issue #115 of Singletrack Magazine, Wil and the team tested and reviewed eight powerful trail brakes. 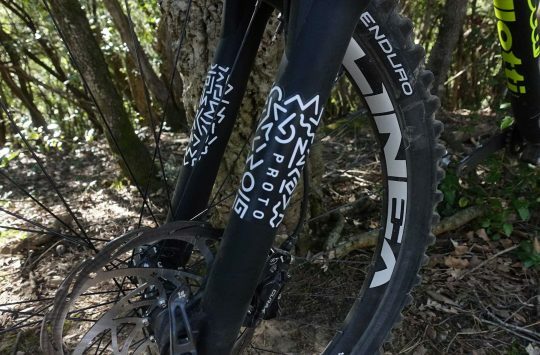 As part of the test process, we took all eight brakes down to Wales for three solid days of back-to-back testing on the slatey, unforgiving, high-speed trails of Antur Stiniog. Each brake was set up with 180mm rotors front and rear, and we left the hoses uncut to ensure the factory bleed was retained. Once we’d had sufficient comparative test time on all the brakes in a controlled environment, we then returned to Calderdale to continue testing each brake individually on more familiar home trails. At the end of testing, we had four awards to hand out, including Best Engineered, Easiest To Live With, Best Feel, and Best Overall. 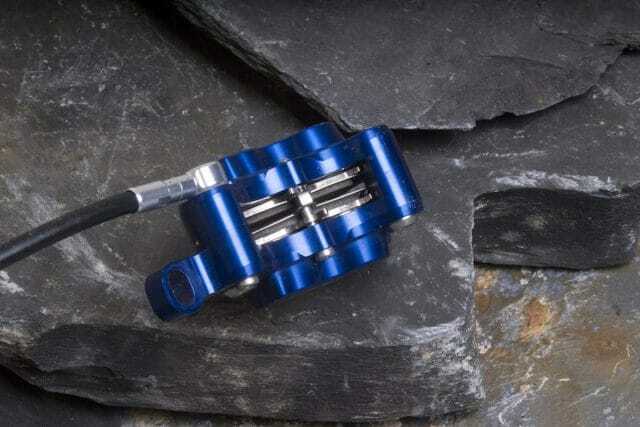 No doubt the biggest surprise of the whole disc brake group test was the Trickstuff Direttissima brakes – an exotic set of stoppers that up until recently, none of us had any experience with. 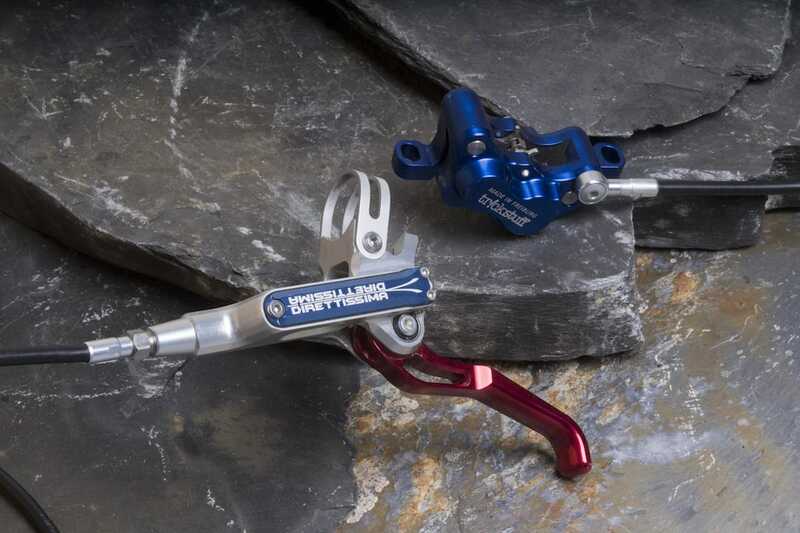 The Direttissima brake from Trickstuff uses a huge oil reservoir and an in-line master cylinder. 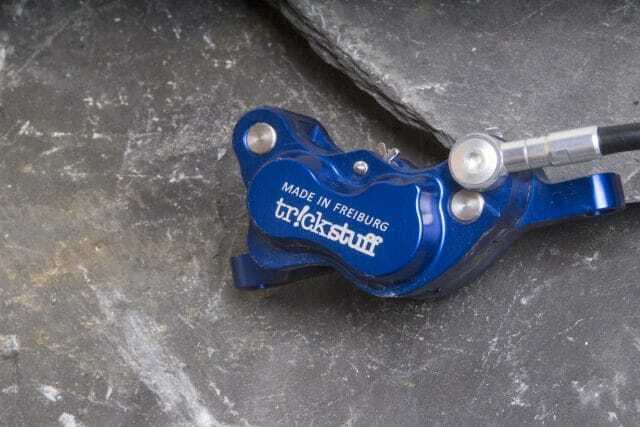 If you’re not familiar with the brand either, Trickstuff is a small boutique brake manufacturer based in Freiburg, Germany. Although it makes a tonne of aftermarket disc brake pads for a wide variety of other brands, Trickstuff’s flagship products are the two brake models it manufactures in Germany. 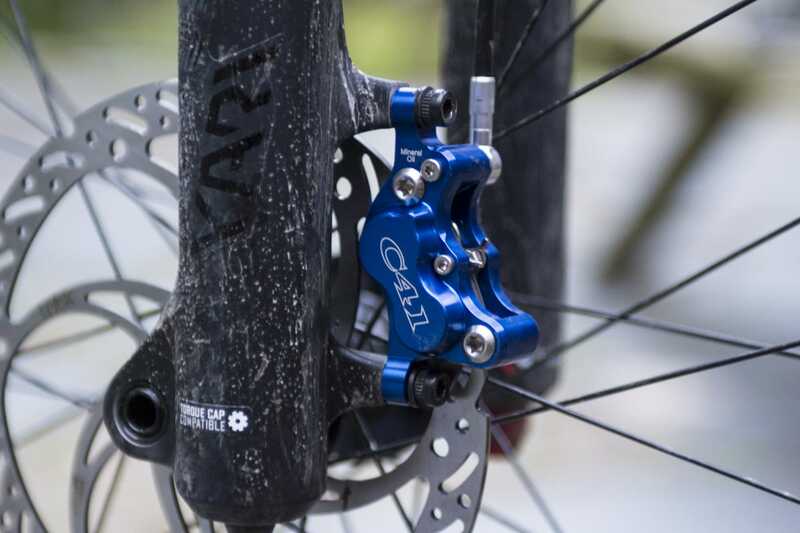 There’s the twin-piston Piccola, which Trickstuff claims is the lightest disc brake in the world at 157g per end. Then there’s the four-piston Diretissima, which Trickstuff claims is the most powerful brake in the world, and which is also used by the Polygon UR team bikes. So we figured if they were good enough for the likes of Tracey Hannah and Alexandre Fayolle, then we could probably give them a shot. These four-piston brakes are the most powerful we have ever tested. 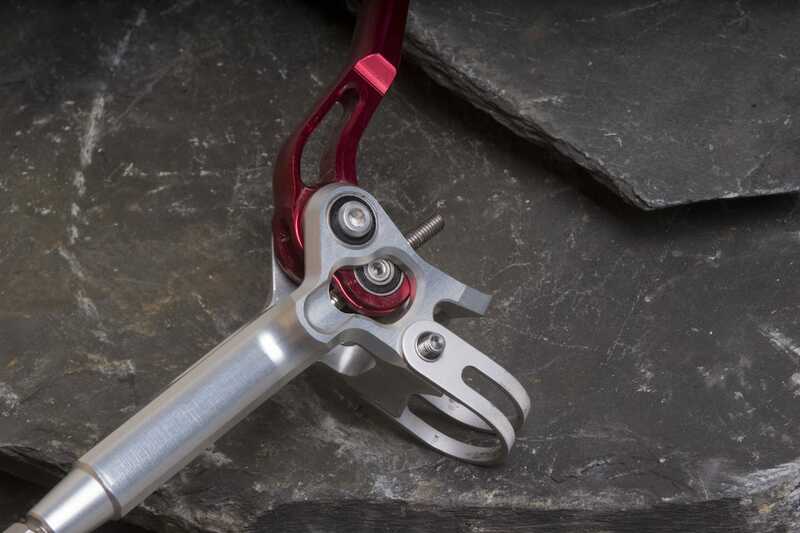 There’s a tool-free reach adjuster, but it sticks out a lot and got in the way of grips and Reverb levers for some riders. Setting up the Direttissima brakes is straightforward, with a lightweight and low-profile band clamp used to secure the lever to the bars. 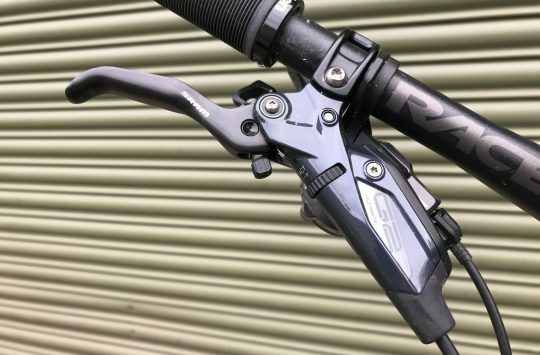 Unfortunately the large reach adjustment dial on our test brakes fouled on the grips, so we had to push the brake lever further inboard than we would have liked. 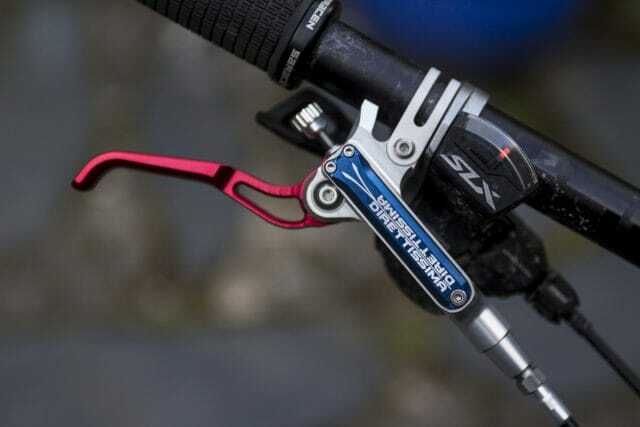 This was rectified by removing the dial altogether, leaving a skinny rod that can be adjusted with a 2mm hex key, and sufficient clearance to reposition the brake closer to the grips. Trickstuff has informed us that the Direttissima brakes now come with a shorter version of this rod to reduce clearance issues, but you’re still unlikely to fit a Reverb remote between the grip and the brake lever. Four sealed bearings per lever – count ’em. We removed the reach adjuster dial. The lever blade itself is wonderfully machined and flex-free, with a gentle hook at the end in which to nestle your index finger. It’s a little longer and thicker in profile than a Shimano lever, which some testers didn’t love, but the polished finish feels lovely and lets your finger slide along it as you push through the stroke. Trickstuff deliberately left the lever blade dimple-free for this very reason. With no less than four sealed cartridge bearings connecting the lever to the body and main piston, there’s no wiggle at all in the lever, and they feel airy-smooth as soon as you start pulling on them. 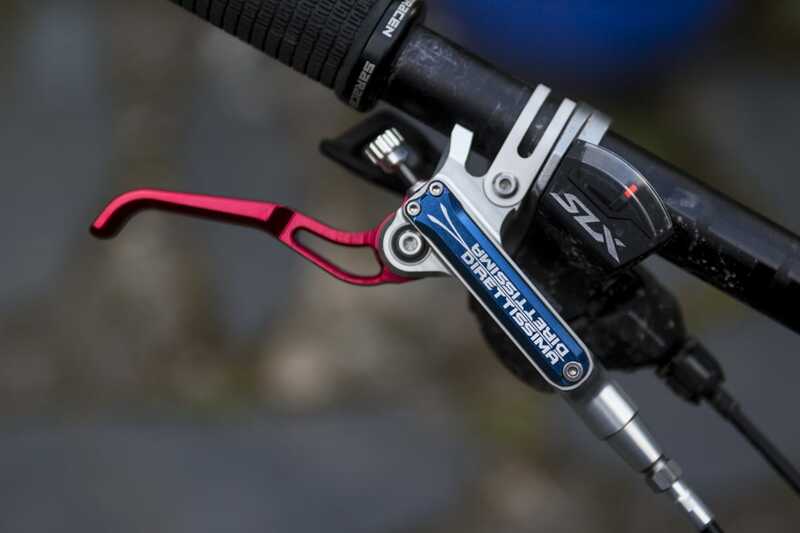 With the exception of the Codes, every other brake lever on test felt sticky in comparison. Stainless steel pistons offer more durability compared to the coated pistons Trickstuff used in the older Cleg brakes. With such an effortless lever throw, the bite point stands out with a rock-solid feel as soon as the pads engage. On some of the more hectic descents at Antur Stiniog where our ears were filled with the clapping of slate underneath tyres, the incredible lever feedback meant there was never any doubt whether you were on or off the brakes. In terms of power, the Diretissimas took the cake there too, being one of the few brakes that we could lock up the front tyre with. Both callipers use a combination of 14mm and 17mm diameter pistons, which are made of polished stainless steel for strength and long-term durability. The power ramps up quite quickly through the lever stroke, with the last third of the travel reserved for altering the earth’s rotation. Trickstuff makes a huge array of disc brake pads to fit many other brand’s brakes, as well as its own. Despite the incredible power though, the Direttissimas deliver excellent control and modulation, and thanks to the positive bite point, none of our testers had any issues with feathering the brakes on slow-speed tech sections. That said, trail riders might want to downsize to 160mm rotors which would help to taper off some of that tread-ripping power. 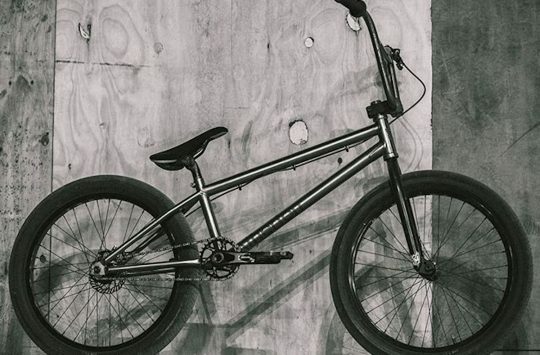 Trickstuff’s own Power+ brake pads must also take some of the credit. While they’re only available in an organic compound, the pads remained fade-free throughout testing, and we never felt the bite point change in the lever stroke – it was always where we expected it to be. Look closely – the rotors have a curved outer edge. Elsewhere, the Direttissma brakes are so well made that they very nearly took the Best Engineered award too. They’re fully rebuildable, and come with a two-year warranty. 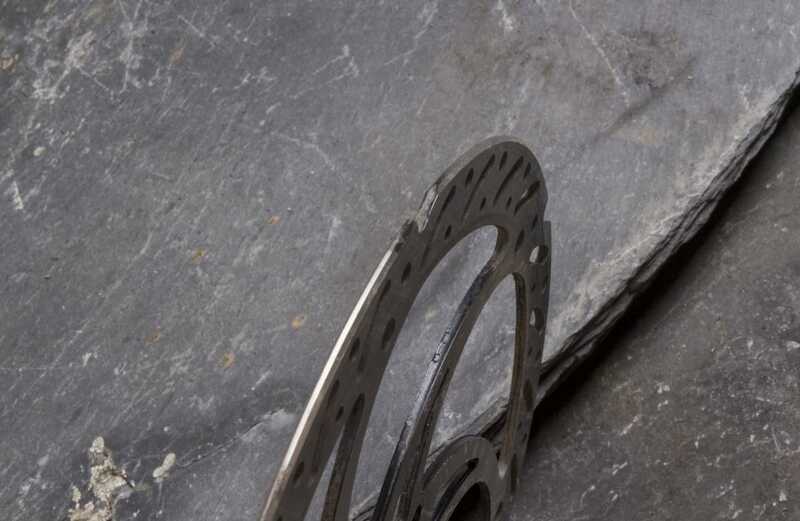 The stainless steel Dächle rotors are very robust at 2.05mm thick, which also helps with heat management. Look closely and you’ll see the edges are chamfered (as are the pads) to make wheel installation smoother. Inside the Kevlar brake hoses you’ll find Trickstuff’s own Bionol oil, which is derived from sunflower seeds and is entirely biodegradable. Swell. If braking feel and power is what you’re after, you’ve just found the best. 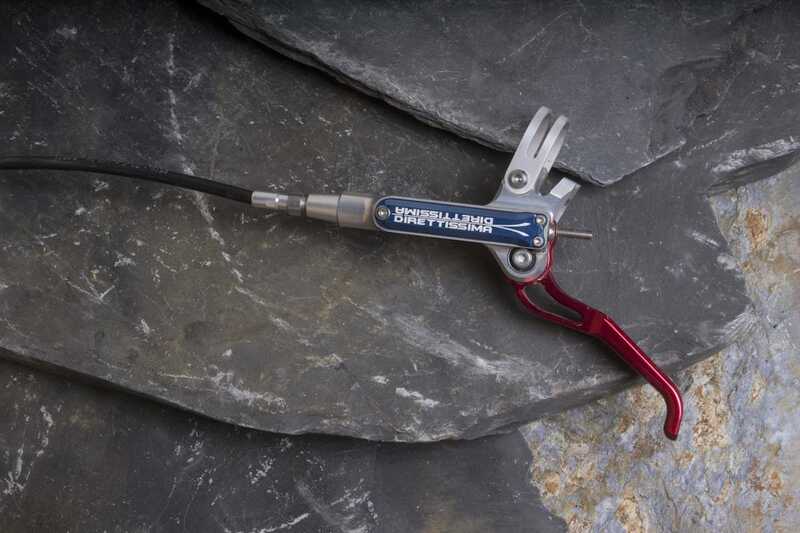 An incredible brake that combines high-quality engineering with eye-watering power, a silky smooth lever stroke, and impressive modulation. 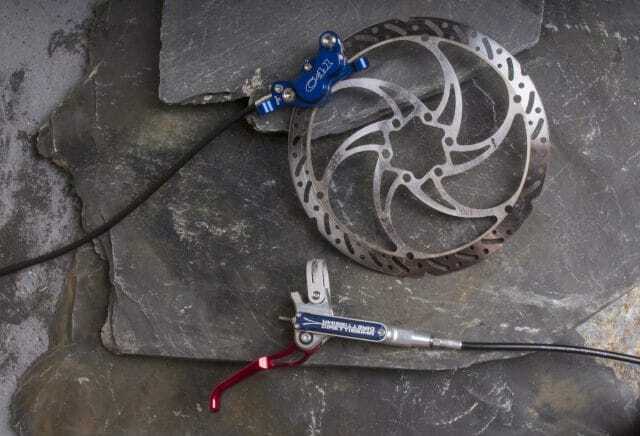 They aren’t cheap, and we’d like to see a lower profile reach adjuster, but as of right now, and if money is no object, the Direttissma brakes are quite possibly the best brakes money can buy. Amanda Batty: "Stop Fighting And Show Your Wilderness Some Respect"